"If the forecast worsens and another deluge is forthcoming, there is no way on earth England are [1.49] shots in a 20-over game"
West Indies would have been disappointed not to get the chance to put England under pressure in Grenada, but not too downhearted. It means they can pick Andre Russell for this one, with the powerful all-rounder added to the squad for the final two matches. Russell is a game-changer in franchise cricket and is the sort of name on a squad list which can sway punters to bet on his team on the outright. Is he as dangerous in 50-overs? Yes. He has a terrific strike rate in the 130s with the bat and, although pricey with the ball, there is no doubt he is a wicket-taker. A wicket every 33 balls is impressive. The Windies need penetration. 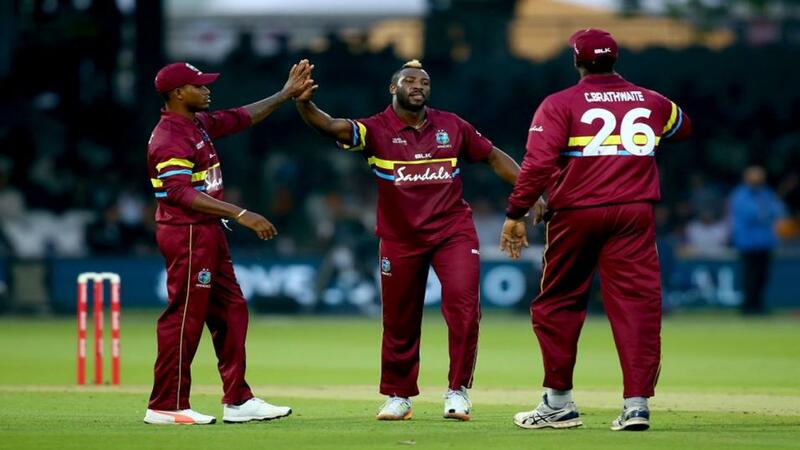 They started the series with serious doubts about their wicket-taking ability but after Sheldon Cottrell wrecked England in game two, the reliable Jason Holder and now Russell teaming up, it's a different situation. Russell has a slight knee niggle but he is still expected to get through some overs. Oshane Thomas will probably be the one to miss out. Despite a washout, England suddenly seem unsure of themselves. Confidence has taken a hit and so has their talisman - Ben Stokes. Stokes was left out of the line-up for game three because of an ankle injury. Stokes would be a big miss, largely because of what he brings with the ball. He is England's second most economical bowler in the series and during the runfest in Bridgetown in the first match, he stemmed the flow brilliantly. With four wickets he is also their joint-top wicket-taker alongside Adil Rashid. Coach Trevor Bayliss said he would be surprised if Stokes did not play but the all-rounder's suggestion that he would be okay to play at St George's gave an insight into the England dressing-room. They are feeling the pressure. If Stokes does not make it, his place would go to Alex Hales. Hales is an opening batsman by trade and we're not convinced of him excelling in a 'finishing' role. Chris Woakes is fit again after a niggle of his own. We were not convinced that St George's would produce a run glut on a par with Bridgetown before the washout. Now a ton of the wet stuff has been dumped on it there could be even more assistance for bowlers. Certainly we can expect a slow, stodgier surface. Rain was forecast for Tuesday as well. No team has passed more than 250 in the last three. England are [1.46] to regain the lead with West Indies [2.92]. It's a pretty similar situation on the odds, then, before the third ODI. But with the rain our spirits about an England comeback have been dampened a little. We have been confident of England getting up in any sort of chase for some time. Indeed, our bet for St George's was the tourists in-running at [1.80] in the hope and expectation that Windies could bat well and then England would regain their composure in a chase after their panic in Bridgetown. Yet a lot has happened despite a ball not being bowled. The return of Russell gives West Indies a player who has the ability to down England on his own while the weather could well mean that England's hitters can't hit through the line with as much confidence. Only showers are forecast for St George's at the moment. We don't foresee overs being lost but bear in mind that if the forecast worsens and another deluge is forthcoming, there is no way on earth England are [1.49] shots in a 20-over game. Hawk Eye was keen on Jason Holder for top West Indies bat before the rain and the 10/1 has been cut to 8/1 by Betfair Sportsbook. Darren Bravo has an excellent record at the ground with two fifties, an unbeaten ton and a man of the match award to his name. The 9/2 (Betfair Sportsbook) could be worth a nibble because he has the ability to nudge and nurdle if the track is tricky. Chris Gayle probably doesn't and his 11/4 favourite status doesn't appeal. Indeed, it is worth betting him to go under 28.5 runs at 5/4. There's an edge in our favour because he should be about 4/5 on career form. On two-year form the 5/4 is about right but we're hopeful the wicket provides us with something extra. Joe Root and Eoin Morgan, purely because they have the technical expertise to thrive in all conditions, are worthy of interest at 3/1 and 5/1 respectively with Betfair Sportsbook. If we had to go with one or the other it would be Morgan because Root should not be as skinny statistically.